An air fryer has become an essential kitchen commodity owing to our hectic and busy work routines where we get little or no time to take care of our health. The air fryer allows you to enjoy your favorite food without feeling guilty about the number of calories and the amount of oil you might have consumed otherwise. So if you are tired of feeling guilty about eating that oily bag of French fries or the piece of fried chicken, then it’s time to get an air fryer and get over your guilt for once and forever. A good air fryer cannot only fry things, but it also has more versatile features such as baking, grilling and roasting food. It makes your life easier and simpler in a lot of ways. The Philips air fryer is based on Rapid Air Technology which can raise the temperature to up to 390 degrees and evenly circulates the air around the entire unit. The fryer requires only a tablespoon of oil while the circulating air ensures thorough cooking of food, making it crispy on the outside and tender on the inside. Philips HD9220/26 AirFryer is one of the top most products in this category and you would be thrilled to have it in your kitchen. In order to help you to know this useful fryer deeply we have explained it in a clear and conside way so that you will work with it better. 2 Why you should buy this Philips air fryer? + The fryer has an adjustable temperature control unit that can be regulated up to 390 degrees. The temperature diversity allows for a variety of foods that can be cooked in the air fryer. + There is a timer setting of up to 30 minutes and the auto-shut off feature can turn off the fryer automatically. + All parts of the fryer are dishwasher safe which makes the cleaning and maintenance process simple and easy. + The cooking basket has a capacity of 1.8 lbs. + The air fryer reduces the fat consumption as compared to usual fried foods to up to 70%. Why you should buy this Philips air fryer? 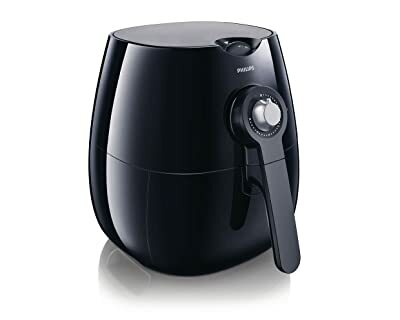 ++ The air fryer is easy to use and the cooking mess is negligible as compared to deep frying while the smell of the cooking food is also minimal and does not spread through the home. ++ The timer can be adjusted anywhere between 5 to 30 minutes, thus prevents overcooking of food. Moreover, as soon as the timer hits the 0, a bell rings to notify you about the completion of the cooking process. ++ The Philips air fryer has a strong hand grip which stays cool during the cooking process and can be used safely while the non-slip feet keeps the fryer intact in its place. ++ There is a cord storage box at the bottom of the fryer which keeps the area tidy and keeps you carefree towards the cable lying here and there across the counter. ++ The air fryer comes with an app that you can use on your smart phone and tablets to assist you through the cooking process and lets you get the most out of your air fryer. ++ A recipe book is also included in the package to introduce different recipes and cooking ideas with the air fryer. The cookbook contains recipes which efficiently exploits the various cooking features of the air fryer such as grilling, baking and even roasting food. – The size of the cooking basket is small which is only sufficient for 2-3 persons. For a large family gathering, you will have to cook several batches of food before a serving is big enough for the whole family. – The cooking time for a batch of fries is around 20-25 minutes and the taste is much different as compared to that of deep fried food items. – It produces a lot of smoke when cooking high density fat food such as chicken thighs or fish fillets. At times the smoke is dense enough to set off the fire alarm. – The Philips air fryer is overly priced for the features it offers and apart from giving the advantage to deep fried foods this appliance is not something you cannot survive without. The Philips air fryer in undoubtedly a great product, but you should consider your family size and your preferred cooking style before going for it. You can make use of this useful and healthy frying gadget at its best when you know your actual frying requirements and the capacity offered along the fryer. Since, it’s rated as one of the best air fryers and has been trusted by numerous users and it would be a gem in your kitchen if you need a low fat food fried to perfection.